today we hear from one of the most beautiful voices in luk thung... that of the esteemed phraiwan lukphet! born in phetchaburi province, phraiwan was sent by his parents at an early age to join a local ลิเก (like) theatre troupe. however, it was the world of popular music which called to him, and he left to join somphong wongrakthai's "bangkok cha cha cha" band. 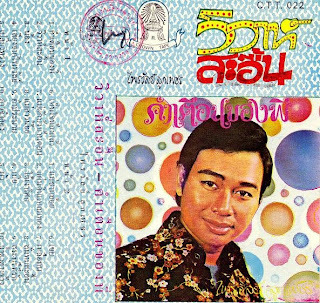 after this group dissolved, phraiwan was entrusted to suraphon sombatcharoen, in whose company he recorded the early hits collected on this cassette. in time he left suraphon's collective to persue a solo venture, and with the aid of songwriter phaibun butkhan, won massive reknown. his singing resonated through the film world especially, where he provided themes to many of the biggest motion pictures, two of which (mon rak luk thung and phlae kao) have been featured here. enjoy the bittersweet nostalgia with phraiwan lukphet! This is gorgeous stuff. Thank you! Peter, this is lovely. Do you know the (dates) of these recodings? Thank you very much. i believe these songs were recorded between 1963 and 1964.